PODCAST 242 IS UP FOR EVERYONE! Hey people! It's time for podcast 242. 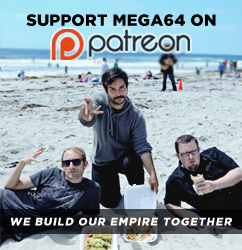 It is a very special podcast, we are joined by our friend Jay from Jabronie Pictures and talk about all sorts of fun stuff: DVDs, YouTube clips of the week, The Phantom Pain, and we also put Mega64 Time Travlers back on sale!Â Last but not least we announce that the Christmas Cast 2012 will be on Tuesday, December 18th at 7:00 PT!!!!! Tell everyone you know to put it in their planners and what not, this is going to be awesome! Check out theÂ the audio version of this current podcast here! Come back soon for more details about the CHRISTMAS CAST on December 18th!!!!!!!!!!!!!! and more video stuff of course!